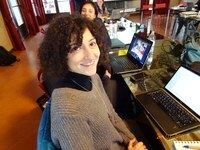 Catia Prandi is a PhD student at the University of Bologna. She is going to finish her PhD in Computer Science (at the Department of Computer Science and Engineering of the University of Bologna) with the thesis "Participatory sensing and crowdsourcing in urban environment". She is involved in different projects and research activities related to Smart City, with a particular focus on the experience of new technologies and devices which can improve the everyday life.